Elaine Hancock (Olney, United States) on 11 October 2017 in Landscape & Rural. This is odd because it is a dairy barn in the middle of a corn field. The barn is used for storage. Corn fields are all around it. C'est très joli tous ces tons orangés. 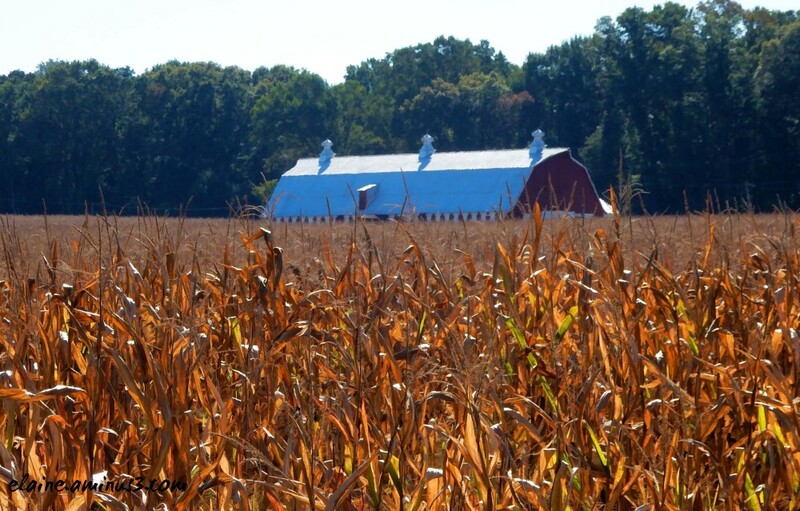 "a dairy barn in the middle of a corn field" . . sounds like the kinda farm I might have ! A very interesting image.....beautiful !!!! I love the way the light makes the corn glow. Beautifully composed. Superb composition with beautiful foreground ! Quel champs dorée et la ferme en fond son toit qui ressort superbe contraste. I guess the cows are gone. Farming is a tough business, sometimes, in spite of price supports. I like the way the corn obscures the barn. It is in a strange place. Very good photo. Beautiful backlit colors captured in the golden corn stalks!! I can feel the barn's stately presence in the Spring when the stalks aren't so high. I like the foreground which gives so much perspective to the barn. It seems to be floating above the corn. Cool shot.